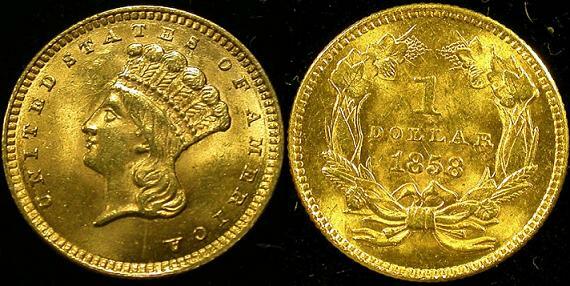 The United States Gold Dollar Coin was authorized by the Act of March 3, 1849 and was produced from 1849 to 1889. It was made of 90% pure gold with a weight of 25.8 grains. The one dollar gold coin is the smallest denomination of gold coins made as well as the smallest size coin of all coins made by the United States Mint. The United States Government didn't originally plan to make a $1 gold coin. However, when gold was discovered and the Carolina gold rush began in the 1830s, a man by the name of Christopher Bechtler offered his services to prospectors and began to turn their raw gold into coins, including a $1 gold coin. Mr. Bechtler was not breaking any laws of the time, but he did manage to get the United States Government's attention. They noticed how successful he was in his venture and congress authorized the mint to create a one dollar gold coins in 1836. The Mint Director, Robert Patterson, didn't like the idea, however, so nothing came of it until 1849 when gold was discovered in California. 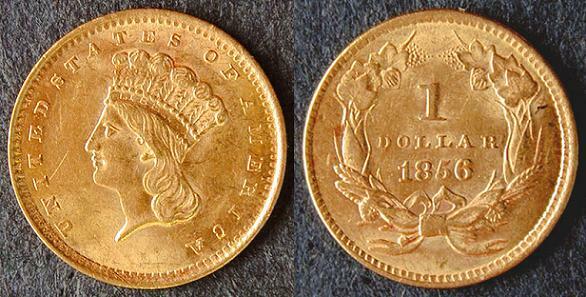 The new gold rush meant a greater demand for gold coins once again. 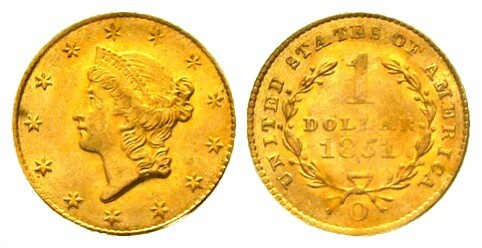 Although Director Patterson still objected, Congress prevailed and the Act of March 3, 1849 authorized production for both the gold dollar coin and the double eagle. 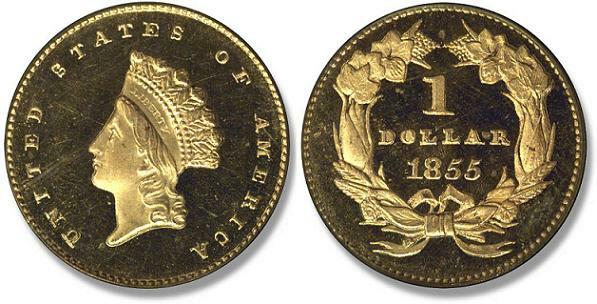 There were three types of the one dollar gold coin struck by the United States Mint between 1849 and 1889. 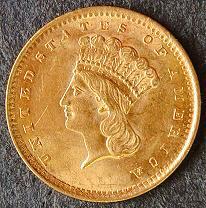 Type I was known as the Liberty Head or small-sized type and was produced from 1849 until 1854. In 1854, the Type 2 was made thinner and larger in diameter. It is referred to as the Indian Princess Head or large-sized type. The design featured a feather headdress on a female. In 1856 the size of the head was enlarged slightly on the Indian Princess and is known as the Type 3. The United States Mint also produced one dollar coins that are gold in color only and contain no gold which are mistakenly referred to as gold dollar coins. These include the $1 Presidential Coins and the Sacagawea $1 Coins.